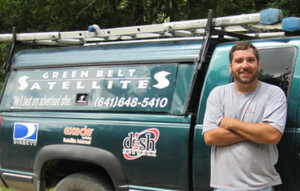 Brian Groninga is the proud owner and operator of GreenBelt Satellites in Iowa Falls. He was born and raised in Sheldon, IA where he developed his strong Midwestern work ethic. He received a BA degree in Business from Briar Cliff College in Sioux City. In 1995 he moved to Iowa Falls, and in 1997 he started in the satellite business as a sales rep for Golden Sky system, a DirecTV franchise owner. Quickly realizing that both Dish Network and DirecTV were great products, each with their own benefits, he went out on his own in 1999. Since then he has sold and installed over 2200 systems. Because GreenBelt Satellites is local, he services what he sells and the turnover rate is less than .5% per year! Nothing keeps customers happier than great service and that’s Brian is a firm believer that a happy customer is the best advertising! After 14 years of installing and servicing Dish systems, Brian has seen and fixed about every kind of disastrous ‘expert’ installation imaginable. And the weather here in Iowa creates challenges as well – heat, ice, rain, hail and lots of wind take their toll on dish equipment making alignment and good signal quality difficult to maintain. No problem – Brian knows from years of experience what works in this climate and what doesn’t so you can be sure your equipment installation is done right the first time. You can learn more about GreenBelt Satellites by reading our testimonials and please check out examples of our work!